Started working in glass in the 1960’s. As a graduate student in architecture at the University of California at Berkeley, John Lewis was introduced to blown glass by professor Marvin Lipofsky. 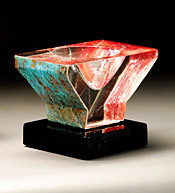 Lewis founded the first private hot glass studio in California and later received his MA in design in 1970. His early work in blown glass led to an interest in glass casting. With the help of an NEA grant, he built an experimental facility to explore the possibilities of cast glass. At his state-of-the-art casting studio in Oakland, CA, Lewis designs and produces cast glass sculpture, tables, vessels and site specific architectural projects. He has completed numerous commissions for private and corporate clients and is represented internationally by galleries. This entry was posted in 1960s Artists, Artist Bio, California Artists, Conference Presenters by dale_beevers. Bookmark the permalink.